Among the first things that impresses an individual is your sense of dressing. No matter how negative impression they had had about you, the person is likely to reconsider hearing you out if you appear smart and stylish. Men come in all sizes and shapes. It’s for you to figure out where you fit and what’s your style? Lucky is the man who has an average built, not too thin not too fat, not too tall not too short because such a person would look awesome in about any outfit. The rest would need care while selecting clothes that enhances their body types. The idea of the correct wear is to downplay your negative body points while drawing attention to the individual’s talent and abilities. Best suited attires for short men are those which enable the observer to have a smooth path from shoes to face. 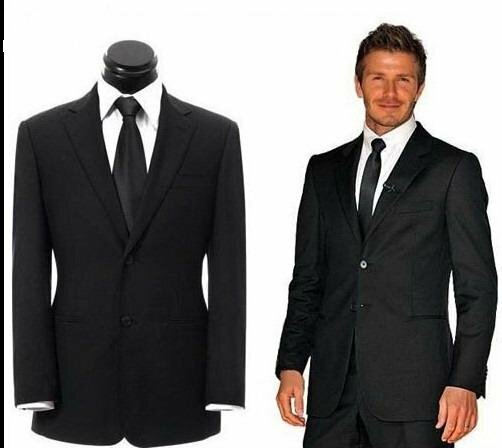 Clothes with vertical lines especially thin ones closely placed together are usually the best choice for a short man. It gives the apparent height to the body. Solid fabrics and dark colours are known to have slimming effect and a combination of these enhances the height factor. Clothes with horizontal lines are best avoided as it cuts the body into half and makes one look shorter. Fabrics with plaids and bird’s eye textured solids are to be chosen carefully. Short stature often gives the impression of the head appearing proportionally larger than the body, hence a matching short cut jacket and trouser helps to downplay this effect. Man in this category often benefits by wearing his pants at the natural waist and should consider suspenders vs belts. This increases the apparent length of his legs. A puff hairstyle and a little heeled shoes never hurted a short man, so go for it! Tall men have problems that are opposite to that of the short men. Horizontal lined clothes are tall men’s friend. Checks and windowpane appears more substantial. Stripes that are widely spaced which are little thicker example chalk stripes compared to thin pin stripes are good choices. Flatter hairstyles and shoes complement a tall man’s look. These men needs to add weight to their bodies. Horizontal lines are good choices. Textured fabrics give more heavier look to the slimmer frame. Thin men's choice should be more of tweeds and glen checks. Overlapping fabric in subtle ways is another trick your tailor can add on your clothes. Go for double breasted jackets, double pleated trousers, square pockets and medium spread collars. Growing more hair on your head helps in your appearance while a bald head gives a thinner look. If your waist circumference is larger than your chest’s than you may fit in this category. Your dressing sense should be such that an observer’s attention should not be fixed onto your waist area. Avoid form fitting clothing instead opt for loose fit around the midsection. Jackets with generous cut and flattening drapes should suit you fine. Vertical lines and dark solid colours gives you more slimmer look. Go for 2 button jackets with deep "V" neck to give an impression of a longer torso. Forget about belts, grab those suspenders and wear your trousers little higher than your waist to give a smooth look around the midsection and increase the apparent length of your legs. Unfortunately, most men do not strictly fit in the categories mentioned above. There are always the combinations. Lets see some of the options for such hard to fit men. The challenge for this group is that too loose or too tight a fit makes them look lanky. Checks and heavier fabric are your buddies. Double breasted suits adds on. Horizontal lines and texture fabrics are wise choices. Go for layered clothing that closely fit, broad belts, wider trouser cuffs, vests and jacket pockets. All these together give more bulk to your thin frame. Avoid pleats, you really don’t need extra room, unless your trousers are screaming tight which is actually a bad idea anyways. Prefer slanted side pockets, these cut on the vertical lines a bit. Big buckles are good for tall men while thin guys can opt for more rectangular ones. Tall man should go for tall ties. The tie should be long enough to reach your belt without leaving a gap. Prefer broader ties that bulk up your chest. Properly tied full Windsor knot adds strength to the neck area. Like everywhere else checks patterns, heavily slanted diagonals and wide diamonds are your options. Remember, stay tucked in while wearing dress shirts. Your T-shirts should be closely fit. Alternatively you can opt for a 3 piece suit. The goal of your dressing style is to appear simple and classic. You just want to add an aura of elegance to your already conspicious self. Simple white and blue defines you well enough but you can experiment with other not too eye-catching colours. Simple lightweight fabrics compliment you more than complicated heavy fabrics (you do not want to add bulk). Solid colours gives you slimmer sober looks without adding extra height impression. Avoid stripes of any sort as both works against your silhouette. A jacket with a deep “V” helps to keep eyes fixed there rather than going at heights they are not used to. Larger pockets, generous lapels, unpadded but properly fitted shoulder all help you look elegant. Pleats on trousers gives you trimmer look. Wider suspenders and pocket squares are your thing. Your socks colour should be closely matching with that of your trousers. This is probably the toughest category in terms of dressing. Many standard clothes that are available at shops needs extra tailoring in order to be wearable for the men in this category. Dark solids are your wardrobe default. Be careful while choosing vertical stripes though. Not every vertical oriented dress shirt may complement your look. Wear your pants high which will drape smoothly over your lower stomach giving you the taller trimmer look. Go for suspenders instead of belts, the latter cuts your height into half. Men with broader waists should go for pleated trousers though this might mean cuffs but a dark coloured trouser may help to hide such details. Avoid light coloured jeans and khakis. You should be allergic to word baggy. In general avoid lots of layerings and designs that give visual clutter. Men of this frame should wear clothes that are tailored proportionally smaller to fit his size and not a larger cut made to fit his frame. Avoid wearing a dress shirt with lots of stripes of varying colour and sizes. Go for narrow point collar styles rather than button down collar. Narrow point means wearing a thin-materialed tie with a small knot, just about perfect for your body type. Remember to keep it simple, you do not want to stuff your appearance but a smooth look is all you need hence avoid breast pockets altogether. If you can't avoid it then have just one and please do not clip a pen in it. Tuck your shirt in neatly. You can’t afford to have shirt tails robbing you of your leg length neither can you allow billows at your waist giving the impression of being swallowed by your shirt. Muscular men have a problem with their too narrow waist compared to the chest and the lower body. This disproportion makes it hard for them to find suitable clothes. Careful tailoring accentuates their frame without giving the overpowering muscular impression. Go for larger lapels; preferably peak lapels. Avoid shoulder padding, you do not want to look like a rugby player on the field. The jacket should be slightly longer covering your bottom. Pleated trousers gives you the freedom to stretch your muscles without adding bulk on to the muscular thighs. If you have a more muscular torso than the lower half than avoid any skinny jeans and downplay the upper body. This is the common soccer player silhouette. Go for jackets with no vents and keep your jacket on all the time. Avoid trousers which are too tight at the waist. The whole idea of dressing sharp is to look proportional. We strive to be presentable and effective in highlighting our talents to the world. Unfortunately human tendency is to get stuck at the negative points of his fellow and so the first impression tends to hold. Its best to be comfortable in your clothes as this lets you and the observer focus at more important tasks at hand.